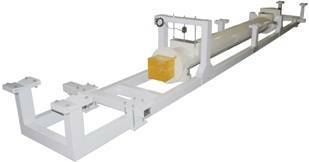 Active Weighing Solutions has introduced a Pivoted Weigh Screw Conveyor suitable for dusty and toxic products. The Pivoted Weigh Screw Conveyor meets the need where a fully enclosed dust tight system is required and existing infrastructure limits the suitability of other weighing solutions. Very similar in function to a fully enclosed Weigh Belt Conveyor or Weigh Belt Feeder, the Pivoted Weigh Screw Conveyor provides an additional and cost effective dynamic weighing solution where existing space is limited. Utilising special stainless steel flexures as the pivot, the system incorporates a load cell and speed encoder to signal an EMC ModWeigh controller. The EMC controller delivers product totalisation and instantaneous flow rate display. The Pivoted Weigh Screw Conveyor uses the same controller and has the same outputs as standard weigh belt conveyor or weigh belt feeder systems: – flow rate retransmission and pulse output. A second analogue card can be fitted to give a second analogue output and a remote setpoint input. Depending upon the application, the Pivoted Weigh Screw Conveyor is fitted with an EMC MW95 controller which can be used in either continuous or batching mode or an EMC MW96 controller which delivers increased functionality and flow rate control. The EMC ModWeigh display is highly customisable, readily allowing the display to be configured to suit the application. In batching applications, the operator simply enters the required batch and presses start. The operator can halt the loading process at any time by pressing the stop button, then pressing continue to maintain the current total and complete the batch. Inclusion of a small logical relay controller located on the operator control panel also allows the operator to start and stop up and downstream equipment. The Modweigh controller’s auto zeroing function is used to ensure the zero is automatically maintained before the next batch is run. The Active Weighing Solutions Pivoted Weigh Screw Conveyor achieves and accuracy of ±0.5% and better of the totalized load. Active Weighing Solutions use Solid Works 3D modeling to model proposed weighing machinery and dynamic weighing systems. Clients can view proposed finished weighing machinery and weighing system solutions before manufacture commences. Active Weighing Solutions has been designing, manufacturing and servicing industrial weighing machines and complete weighing and bagging systems for more than 15 years. Their products provide long term reliable and accurate weighing based on a comprehensive understanding of the materials handling properties of each product in each specific application. Active Weighing Solutions designs take into account site operational requirements, occupational health and safety, economic considerations and ongoing maintenance requirements.